The following is a gallery of news photos taken at hundreds of protests, all of them held TODAY, in dozens of countries around the world. Trust me, you'll want to scroll through the whole thing. Might take a bit to load. 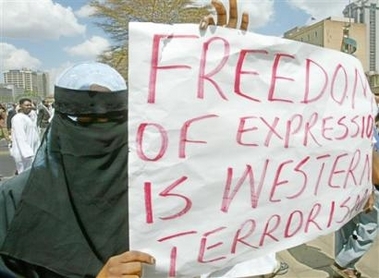 Moderates in Africa are disgusted over the intolerance of extremists Muslims calling for press censorship. South African Muslims protest bin Ladenism in all its forms. Muslims in Jordan stand up for Democracy and the underlying preconditions for it of freedom of expression, speech, and religion. Jordan is often cited as an example of a 'moderate' country. Muslims in Venezuela stand up for America's First Amendment freedoms. Muslim tolerance crusadors in the moderate Muslim country of Malaysia where all religions are equally respected. These moderates are protesting the notion held by extremists that Denmark should be boycotted for the government's failure to suppress speech. Iranian moderates hold a candle-light vigil in front of French embassy on news that French publications are also showing blasphemous Muhammed cartoons. Pakistanis demonstrate their solidarity with Denmark's long history of free-expression by warmly displaying the Danish flag. Large crowds in Bangledesh, a model of moderate Islam, come out against tiny minority of extremists. Indonesia is often cited as a model of Muslim 'moderation'. These Indondesians clearly 'get it'. Incidentally, it is only a couple of people--kind of like Timothy McVeigh and Terry Nichols--who are extremist lunatics in Indonesia. Muslim women in Belgium show the completeness of their integration into European society at rallies for free speech today. Dutch Muslims vigilantly guard press freedoms in a protest in Maastricht, Netherlands. Long a bastion of moderation, Muslims in Turkey mistakingly display the Swiss flag, which is similar to that of Denmark. Sri Lanka, the adopted home of Arthur C. Clarke, has a large and moderate Muslim population. Members of the large Muslim minority in Macedonia display their solidarity with U.S. and Danish norms of the ability to criticize religous ideas in all their forms. Egyptian Muslims outside of Al-Azhar Mosque, the most prestigious Sunni seat of learning in the world, are angered that a tiny minority of extremists are heard shouting 'Osama bin Laden, explode Copenhagen'. Apparently this is some sort of exotic shoe ritual. One of the few demonstrations by a tiny minority of extremists against the Muhammed cartoons. As you can clearly see, the fact that so few showed up at this protest in Bhopal, India speaks volumes for Islam's tolerance of those wishing to express theological differences. More Indian Muslim followers of Muhatma Gandhi's tolerance message. Even the few protesters who did show up to protest in India clearly understands that it would be immoral to boycott an entire nation for what a single newspaper did. More evidence that moderate Muslims are ready to act maturely and take their proper place among the community of nations. Muslims in Israel show that they clearly understand the concept that vulgar speech--such as blaspheming the Prophet Muhammed (swt)--may be bad, but is no crime. Muslims in Russia clearly understand freedom of expression. More moderates in Kenya promoting ecumenical understanding between all faiths. Kenyan Muslims huddle-up before the big pro-free-speech rally. Gooooo freedom!! Photo attributions: Reuters, AP, AFP via Yahoo News.